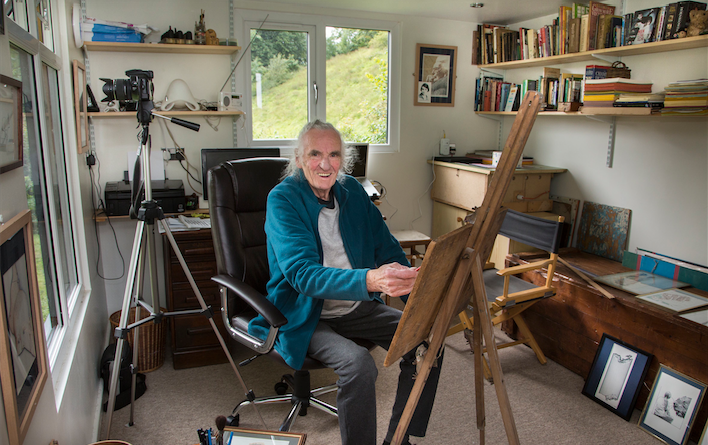 Artist and book illustrator Ed Fisher doesn’t have far to look when he’s in need of inspiration - just beyond the window of his new Garden Room Art Studio, deep in the North Wales countryside, there are trees, wildflowers, a babbling stream and a constant flow of birds. The former RAF aerial photographer now spends his time capturing the charm of the world around him in the Dee Valley, an officially designated Area of Outstanding Natural Beauty. With a creative heritage that traces back through four generations of artists, Ed has just relocated from his home of 45 years to move in with his long-term partner Fiona, an author and story-teller, whose books of folk stories for children he also illustrates. Together, the couple live just outside Carrog, near Corwen, where Fiona does her writing in the cottage they now share while Ed has his studio, which they had specially built by Rubicon Garden Rooms, to take full advantage of the wonderful scenery around them. There he produces his particular brand of art, many of which adorn the walls of his new studio. They include extremely intricate and precisely executed works taking in subjects as diverse as trees in the area around his home drawn in pen and ink to a study of Chester Cathedral done on the dot matrix principle. Other works include a painting of a crowd at a farm sale to a fascinating interpretation of what a traditional Victorian villa would look like if transposed from London to the deep Welsh countryside. “I did that one because a friend of mine in London said I’d never done a picture of her house, so I did and set it in Wales,” explained Ed, who has just celebrated his 77th birthday and rediscovered the depth of colours following cataract operations. Another striking image he produced was a pen and ink drawing of a tree, which appears intriguingly like the torso of a man with his muscular arms outstretched. There’s also a fine study of a local yoga teacher in which Ed is particularly proud of the line of the outstretched leg he was able to create. Another in his archive is a lifelike self-portrait in pencil. In recent years his work has been displayed in places like Theatr Clwyd in Mold plus galleries in Llangollen, Corwen and at the National Eisteddfod when it was held in Mid Wales. Although Ed says that while he has often sold his prints to make money, he likes to keep most of his art for himself. For art-lovers, the best place to spot Ed’s magical work is in the pages of Fiona’s four books, which are flavoured by stories of Wales’ ancient Mabinogion legends - Folk Tales of Denbighshire, Folk Tales of Wrexham, Ancient Legends Retold and North Wales Folk Tales for Children. Mostly done in Ed’s favoured pen-and-ink drawing style, the illustrations include a ferocious red Welsh dragon sure to strike terror into the hearts of readers and a thoughtful interpretation of the famous Welsh tale of Branwen and Bran, in which a forlorn young maiden looks out longingly across the Irish sea to the little bird who is her true friend. Gracing the pages of Fiona’s Denbighshire folk tales book is a powerful picture of Welsh prince Owain Glyndwr, which Ed based on the statue of the local legend that stands proudly in the centre of Corwen. The couple have been together for 14 years after meeting through a mutual friend, and as their relationship blossomed they began to also work together artistically. “It’s been a quite a good professional partnership between myself and Fiona, and all the books have been very successful,” said Ed. Ed was born in Wallasey on the Wirral but moved at just three months old to Llanfairfechan on the North Wales coast where his family set up home to escape the bombing of Merseyside in the early years of World War Two. After attending the village school and later Ysgol Friars in Bangor, Ed joined the RAF as a teenager in 1957 and chose photography as his trade. He served in the UK as well as doing two-year stints in Cyprus and Singapore. He recalled: “In Cyprus, which at the time was in the throes of its fight for independence, we were doing photographs of serious things like bomb damage, accident scenes and funerals but we also took pictures of royal visits such as the ones I did when Princess Alice of Athlone came to the island. Ed left the RAF while he was still in Singapore in 1964 and actually hitch-hiked all the way back home to Britain. Shortly afterwards he decided it was time to enrol at Hammersmith College of Art in London to formalise the interest in art he’d had since childhood and which, he believes, was in his blood with generations of artists in his family lineage. “My father, grandfather and great-grandfather in turn had all been artists. In fact, my grandfather Josh Fisher, who died at the end of the war, was a well known landscape water colour painter and his works are still sought after. My great-grandfather James was also an artist - amongst my possessions is a heavy wooden policeman’s truncheon he decorated and which had been used during the Liverpool riots of 1837,” added Ed. At the end of a four-year course he left art college in 1971 with his degree but not before he’d been involved in the art school revolution of 1968. He explained: “I was a staunch member of the hippy era. People might remember that it was about students like myself taking over art colleges because they were unhappy about what was being taught. After college he reckoned it was time to leave London and return to his native North Wales and he moved into a cottage in the countryside near Carrog, just up the hill from his present home, where he stayed for the next 45 years, often earning his living as a craft worker and staying true to his youthful hippy ideals. “I used to make wooden pendants and now I’m learning a form of kung fu, through a Shaolin Temple monk who lives in Wrexham - I fell in love with martial arts through doing tai chi,” said Ed, who has also taught the Far Eastern method of controlled but complex movements. He admits that leaving behind the home, where he’d helped raise two stepchildren with a previous partner, and moving in with Fiona was traumatic, as it meant he had to sort through decades of belongings and art work. Even so, the couple realised that Fiona’s house was simply not big enough for their joint possessions and also provide space for them to work. Instead, they decided to make use of the large informal garden, which has a stream running through it. 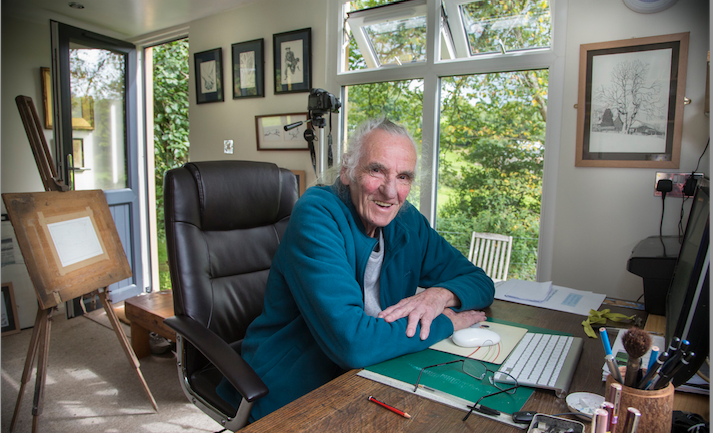 And for Ed, it meant that he could finally have a purpose built Garden Studio that would be a refuge, no matter the weather, yet that still provided a link to the real world, with internet connection and a phone plus room for his artworks, materials and cameras. The couple turned to specialists Rubicon Garden Rooms of Deeside to supply and install the building, which has plenty of windows to capture as much light as possible. 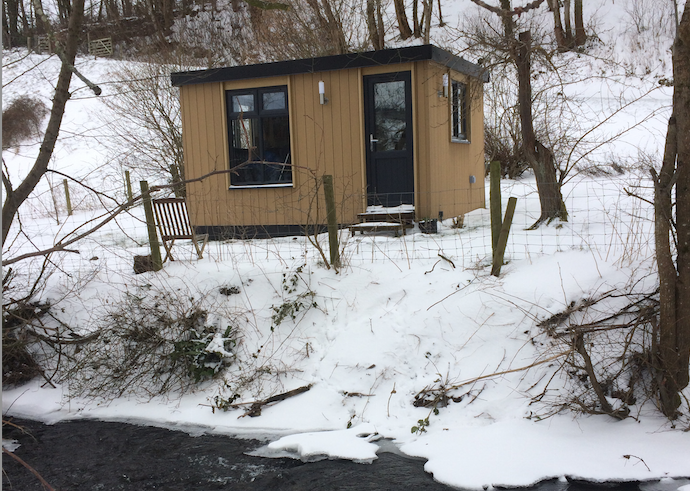 Ed said: “When Fiona and I moved to this house we found there wasn’t enough room in it for her to write and for me to have my studio, so I ordered the 4 metre x 3 metre room from Rubicon. “It’s perfect for my requirements. The exterior is maintenance free thanks to its wood-fibre material, it’s fully insulated and double-glazed and has a power supply with a heater. “It easily fits all my things, like the desk I inherited from my late father, my books and my artwork. “I opted for Rubicon because they’re a local company with a good reputation - I was able to go to the showroom in Deeside to see the different styles - and I like their whole approach and attitude. “As an artist I can also say that the Garden Room is also aesthetically pleasing and fits well into the surrounding countryside, which is very important as we’re part of an Area of Outstanding Natural Beauty. Rubicon Garden Rooms managing director John Lyon says he is seeing an increasing trend among customers for buildings that allow them to pursue their creative dreams while giving them extra space. 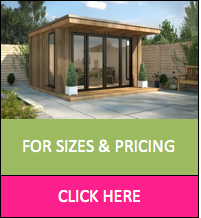 The company has more than ten years of experience in the building industry, and specialises in the manufacture and installation of luxury Garden Buildings. Fully insulated, they use hi-tech wood fibre material to enhance comfort and are zero-maintenance. John said: “Art for many people is not just a hobby, it’s a profession and it needs plenty of space where they are separate from the distractions of everyday life. Initially they start by looking for a larger house, only to realise that they don’t want to move elsewhere and they’ve actually got room to expand, into the garden.